From the looks of “The Highwaymen,” you might think it a dated “Dad’s movie” as it’s been dubbed, or just another cops and robbers movie. John Lee Hancock has found success with movies set in Texas like “The Rookie,” and “The Blind Side” (which was actually shot in Georgia, because Texas does not offer the incentives to filmmakers that other states do). He returns with another Texas story in “The Highwaymen” (filmed in Louisiana this time around). Kevin Costner is very comfortable in the role of the stoic lawman who went after Bonnie & Clyde, a part that Robert Redford was developing for himself to co-star with Paul Newman before Newman’s death. “The Highwaymen” takes on a story we all feel we know well after the numerous times this story has been told including the 1967 Academy Award-winning classic. However, it is the point of view of this film that gives it its unlikely selling point. “The Highwaymen” is also elevated by John Schwartzman’s cinematography, or at least his study of what worked so well in “Road to Perdition.” Speaking of “Road to Perdition,” that film’s composer, Thomas Newman, is behind the score on this one, also that earlier film. It’s 1934 at Huntsville’s state prison. Bonnie & Clyde, already the most wanted, most infamous killers in the nation, stage a prison break for three of their buddies. 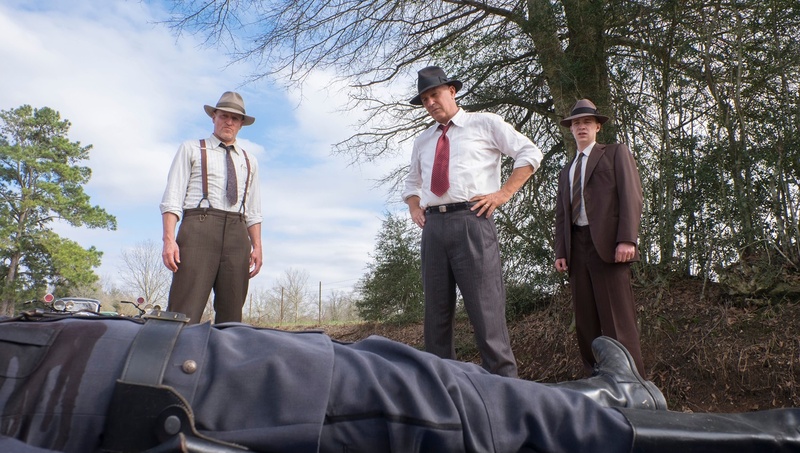 They are called The Barrow Gang, and things have gotten so out of hand with the number of police officers they murdered, Texas Governor Ma Ferguson (Bates) calls in retired Texas Rangers Frank Hamer (Costner) and Maney Gault (Harrelson). Their task is to end the trail of bloodshed and embarrassment caused by the Bonnie Parker and Clyde Barrow. “Used to have to have talent to get published, now you just shoot people,” says Gault mocking the countries fascination with the celebrity criminals. The world has changed since the two rangers were in the game, and while their jurisdiction ends at the state line and the border, Hamer won’t rest until justice is served no matter how many lines he must cross. Best looking film on Netflix since “Roma’s” debut. “The Highwaymen” might run a bit long, but surprisingly it’s the third act, closer to the inevitable finale that’s the most tiring. Fleshing out the characters, especially the motivation of Frank Hamer is where this film is successful. It’s the preparation, the discussion with his rich wife (the always stellar Kim Dickens), the acquisition of firearms, the realization that he isn’t a young man anymore, these are the moments that invite the audience into the story. The script spends time as Hamer works out if he is fit for the job and why the job is important. Neither Costner nor Harrelson give a performance they couldn’t do sleepwalking, cast for their stereotyped on-screen personas as much as their name recognition, they still manage to be entertaining in the plainest sense of the word. Assuming the audience is familiar with the 1967 film, “The Highwaymen” intentionally keeps the camera off the faces of the stunt actors playing Bonnie & Clyde. It doesn’t quite drive home the phenomenon of how and why the outlaws became pop culture icons as heavily as it could. We see scenes of fans fawning over their bullet-ridden car and begging for autographs, but the only disapproval is conveyed singularly though Costner’s eyes. The third act, as the lawmen move in on the outlaws, drags it’s dusty boots. The cinematography loses its punch, we see too little of Bates, and the film becomes what it’s tried to avoid in the first half. It’s still the best looking film on Netflix since “Roma’s” debut. "The Highwaymen" is adequate filmmaking and perceptive while pacifying familiarity.